1. Boil a kettle full of water. Pour 100ml boiling water into a jug. Submerge the dried mushrooms in it, then cover and leave to soak for 10 minutes. Remove the mushrooms, finely chop and put into a bowl with the breadcrumbs and oil. Rub together with your fingers until well mixed. Heat a non-stick frying pan and cook this mixture over a medium heat, stirring often, for about 7 minutes until crisp and brown. 2. Meanwhile, half fill a pan with hot water from the kettle and bring to the boil. Using a steamer, cook the broccoli over the pan for 5 minutes, until just tender. Remove the steamer and set the broccoli aside. 3. Salt the pan water, crack in the eggs and turn off the heat. Cover with the steamer layer and leave for 4-5 minutes until the eggs are set with soft yolks. 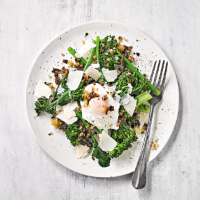 Serve the broccoli topped with the eggs and crumbs. Finish with the cheese. Cook’s tipIf you don’t have a metal or bamboo steamer, then put the broccoli in a heatproof colander or sieve and cover with a lid. This recipe was first published in Tue Aug 14 08:13:00 BST 2018.